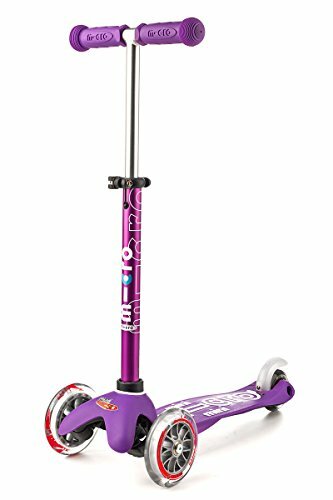 The new Mini Deluxe has all the features that made the Mini Original the best-rated scooter for children ages 2-5. The Mini Deluxe comes in 8 great colors, has a higher weight capacity of up to 75 lbs and the new adjustable T-bar accommodates little ones as they grow (the T-bar adjusts from 17" up to 25" from the deck - this is 1" higher than the Mini Original's stationary T-bar). Your child will love riding this award-winning Micro and you will love the years of fun and exercise it provides your child. The smooth-gliding wheels, low-to-the-ground deck and stable steering all make the Mini perfect for pre-schoolers and kindergartners. What makes the Mini Deluxe unique is the adjustable T-bar and lean-to-steer design; children steer by using their body weight to lean right and left, intuitively learning to lean into a turn, while developing the balance and coordination used in many sports. The Mini has the smoothest, quietest ride available thanks to high quality wheels and a flexible fiberglass reinforced deck, which together absorb bumps in the sidewalk. Safety certified by the CPSC, the Mini Deluxe is recommended for children up to 75 lbs. SAFETY - For best protection, we recommend that children wear helmets and knee pads when riding. Non marking wheels allow children to learn to scoot in the safety of your home. View More In Kick Scooters.